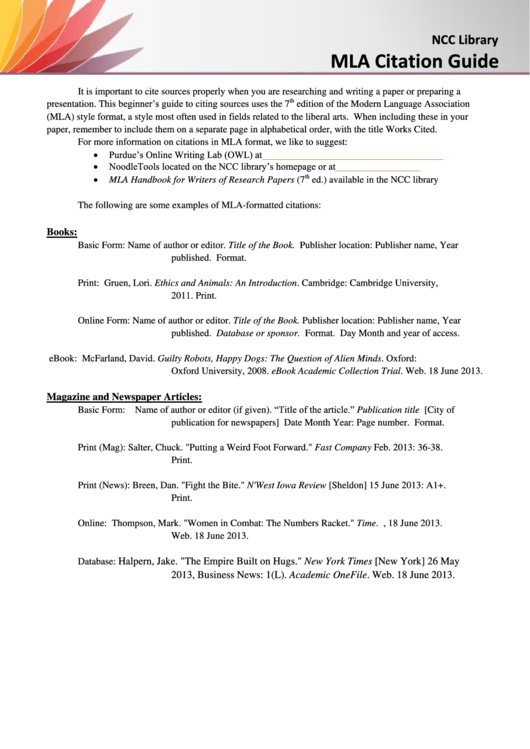 paper, remember to include them on a separate page in alphabetical order, with the title Works Cited. published. Database or sponsor. Format. Day Month and year of access. Oxford University, 2008. eBook Academic Collection Trial. Web. 18 June 2013.
publication for newspapers] Date Month Year: Page number. Format. Salter, Chuck. "Putting a Weird Foot Forward." Fast Company Feb. 2013: 36-38. Breen, Dan. "Fight the Bite." N'West Iowa Review [Sheldon] 15 June 2013: A1+. Thompson, Mark. "Women in Combat: The Numbers Racket." Time. N.p., 18 June 2013. 2013, Business News: 1(L). Academic OneFile. Web. 18 June 2013.